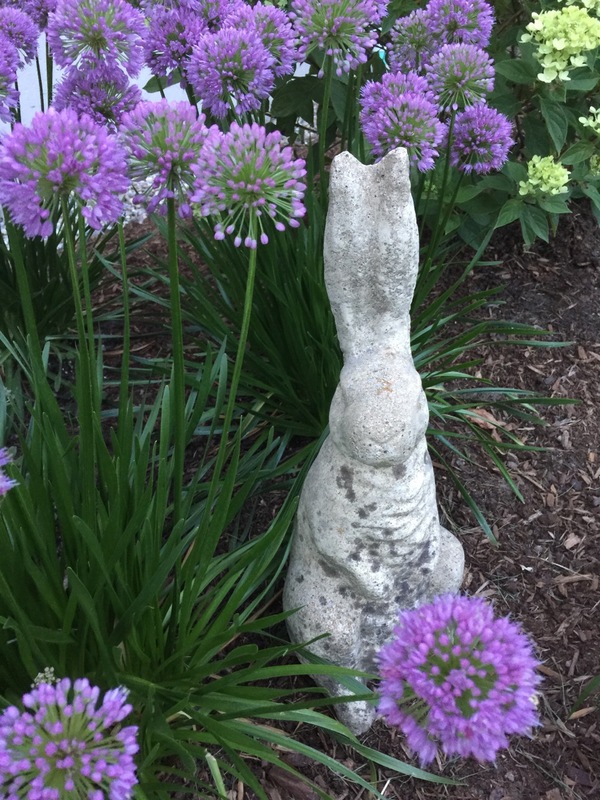 It’s peak pollinator time in New England gardens and I’m a little surprised at what plant in my garden is getting all the action. I do maintain a garden that is constantly in bloom but I’m more of a blooming woody shrub lover than perennial flower lover for two reason. 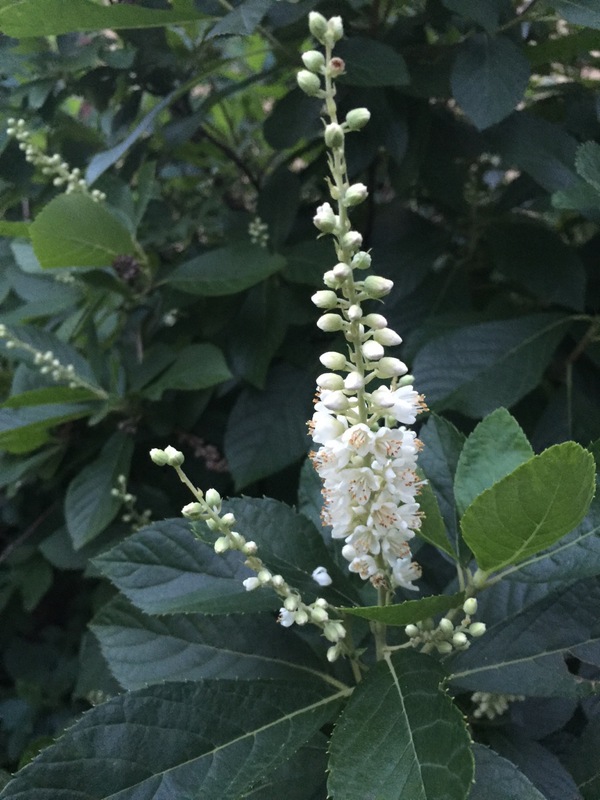 Shrubs need less maintenance than perennials… and there’s something quite magic about the color green… the variety of shapes, colors, and textures of green leaves that shrubs and trees provide in a garden attracts and soothes me like no perennial can. All that being said, I do provide perennials as accents and splashes of color in the garden. I especially want to provide nectar for pollinators and host plants for a variety of butterflies. The summersweet (Clethra alnifolia) is just beginning to burst upon the scene but it’s being ignored by insects. The butterfly weed (Asclepias tuberosa), butterfly bush (Buddleia davidii), liriope, hostas, daisies, sunflowers, and a few others are being shunned for this small bloom. 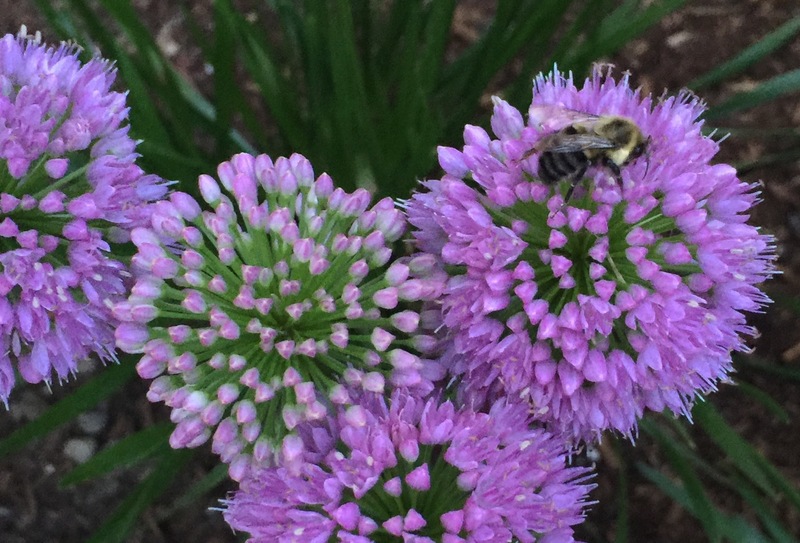 Mobbed by bees, butterflies and hummingbirds, this small allium seems to be the bee’s knees right now. Not in full bloom but those blooms that are open are a’buzzing with activity. 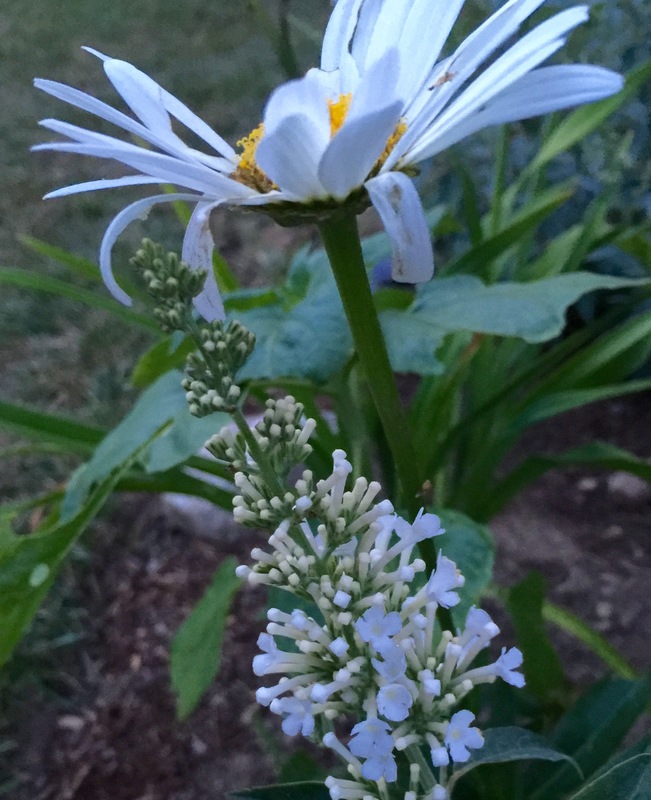 Sorry… butterfly bush, daisies, summersweet… I’m sure your time will come. It Was The Best of Times, It Was The Worst of Times…. Whew! 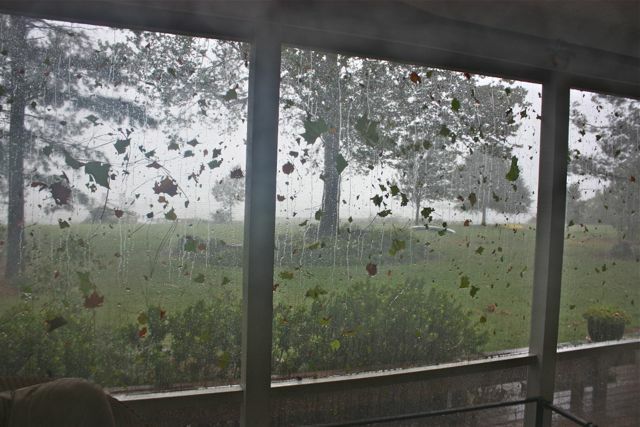 Irene packed quite a punch in Tidewater Virginia. 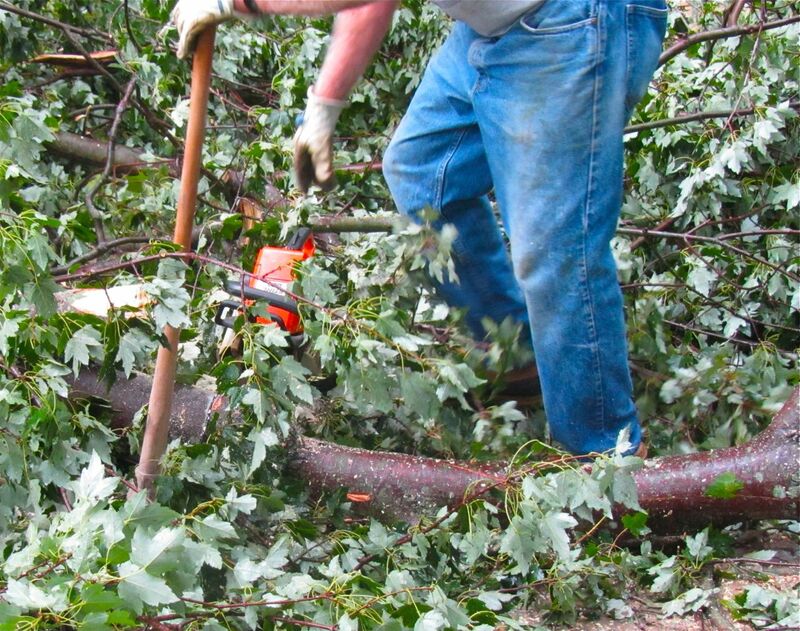 We awoke to a cleanup nightmare but we weren’t fazed by the sight of branches, trees, and debris. We spent the nighttime hours worrying about the worst that could happen and awoke to the best… only because we came through the hurricane unscathed. As with all storms of this magnitude, the morning after brings the hum of chain saws, the songs of hungry birds and the sight of boats on the river returning to their moorings. Cleanup has begun all over this yard and we’ll soon be back to a normal routine. mister gardener is tackling the larger job of cutting up three large trees that were downed by the storm, a magnificent white pine and two old maples, one that fell across the driveway. After our job is completed, we will venture out to see what assistance our neighbors need after Irene’s assault on Ware Neck. We left plenty of nectar in the garden for the hummingbirds during the storm but they were buzzing around the feeders in force this morning to top off their little tanks. Our thoughts and concerns are with those less fortunate individuals who were casualties of this massive storm in property and in person. Every two and a half weeks I stand in line at Costco along with other bulk shoppers, their carts full of king-size supplies of food and my cart containing only two items….two king-size bags of sugar, 50 lbs. of sugar to be exact, just enough to fill 7 hummingbird feeders with nectar for about 18 days. There is a formula to estimate how many hummers reside in an area by the amount of nectar they consume but we aren’t interested in knowing. We only know we have oodles of Ruby-Throated Hummingbirds that are drawn here year after year by an abundance of food, water, and nesting sites. Suburban and rural gardens are ideal hummingbird habitats with trees, shrubs, open areas of grass or meadows, water and flowers. With the addition of the right flowers, most gardens will attract these miniature thespians to entertain you in the garden. These “glittering garments of the rainbow,” as John James Audubon called them, are the most colorful and prolific bloomers in our gardens from early spring until late fall. We recognize the same individuals as they arrive each spring, not only by their familiarity with us, but by unusual markings on some of them. Several of our hummers are leucistic, a condition of reduced pigmentation in the feathers. As new generations are born each spring to these birds, it is interesting to see the white leucistic variations on the heads of the offspring. We are entertained by the raging territorial battles to protect their nectar source. They battle each other, bees, birds, the dogs and people. As the ‘king’ of one feeder chases an intruder, several others slip in to have a sip from his nectar cache. These jewel-colored birds with their explosive and ferocious territorial dances at speeds of up to 60 mph provide us with 4th of July fireworks every day of the summer. The Ruby-Throated is the only hummer to breed east of the Mississippi yet during migration you can see other varieties passing through. Hummingbirds are great pollinators, often better than bees because they feed continuously from dawn to dusk. Hummingbirds do eat insects: gnats, mosquitoes, spiders, aphids, etc. In the early spring they will look for insects trapped in sap from woodpecker holes. Females do all the nest building, often attaching it with spider silk and pine resin, and camouflaging it with lichens and fungus. The nest is walnut-sized and the 2 eggs are pea-sized. The male continues to court other females after mating. Predators include spiders, preying mantis, dragonflies and other birds. I have witnessed a bullfrog in our pond jump a foot straight up to within 1/4-inch of a hummer at a pickerel weed bloom. We have rescued them from spider webs and nursed them from collisions with each other. At night, due to their small size and lack of insulation, hummers enter a state of torpor, a hibernation-like condition where the breathing and heart rate slow dramatically. Nectar recipe: 1 part white granulated sugar to 4 parts water. According to Bill Williams of William & Mary’s Center for Conservation Biology, it is not necessary to boil the solution, just dissolve the sugar. The nectar solution can be stored in the refrigerator for two weeks. Do not use the commercial red dye solution. Keep the feeder very clean to avoid black mold that can be harmful to the birds. Bill Williams also states that the Ruby-Throated Hummingbird has recently been documented wintering over in two Tidewater locations. Is this a new trend? It very well could be he says. Plants to attract: hibiscus, flowering quince, currants, weigela, azalea, mimosa, and buddleia. Flowers to attract: morning glory, columbine, trumpet vine, fuschia, bee balm, bleeding heart, honeysuckle, virginia creeper, and salvia. Remember, they are attracted to the color red.